OK, I admit it, it was wonderful! Produced by The Belgrade Theatre of Coventry, this is the Birmingham Repertory Theatre's production of the Musical version of a film I have never seen. I therefore went this evening with absolutely no prior knowledge of what to expect. I have one more admission too, as I sat in the theatre and looked at the very Christmassy set and listened to a stupid and twee voice-over asking us not to use our mobile phones. I then witnessed an awful introduction to the show, absolutely hating what I was watching for twenty minutes. However, once I caught on and started seeing it on their wave-length, and started to watch the children and enjoy their superb skills rather than concern myself with the grown-ups, I was hooked. The more I watched the more I laughed, and the more infectious their corny and down-right silly humour was. The perfect antidote to the cold weather and blood-boiling daily news reports. It is also a very long time since I saw a mainstream show which was so reliant on and narrative-driven, by children. Even Oliver and Annie don't come close. And in this instance it was the children, very young children at that, who were the stars of the show. They were magnificent and I simply cannot praise them highly enough. There are three separate teams (just a list of names) in the programme, but most unfortunately I seem to be unable to find any way of crediting these wonderful youngsters by name or character. That's such a pity since it is they who deserve most of the credit for this show. A brilliant young girl in glasses who was the Star of Bethlehem, a brilliant quartet taking the Mickey out if a boy band, a rapper, etc, etc, and some truly excellent characterisations, an all singing and dancing group of talented young children. The storyline, for those interested, is the typical cutesy, friends as children grow up and go their separate ways, but all come back together in the end kind of story. Three friends from Coventry; one goes off to Hollywood to be a film producer and ends up working as a PA to someone else, one auditions for theatre school and ends up teaching in a crummy, bottom of the Ofsted register Roman Catholics Primary school, whilst the third finds himself as a Primary school teacher at an elitist private school. Of course there is rivalry between the two teachers as they compete each year for the prize of winning the local Nativity play competition, and this is where the story really starts. A newbie teaching assistant is assigned to Mr Maddens, the Catholic school teacher and anti-hero of our piece, overhears a lie which gets blown out of all proportion. The lie being that his friend, the 'big Hollywood producer' from all those years ago, is going to come over to Coventry to watch their play and make it into a film. In the end, Hollywood do come and they do watch the school's stunning play in the grounds of Coventry Cathedral, and of course boy meets girl and all ends happily ever after! Playing the role of newbie teaching assistant Mr Poppy, was Simon Lipkin, and it was his introduction this evening which really put me off; however, like I have already written, once I put myself on his and the show's wavelength I was totally hooked and he did give an incredibly likeable performance. The three friends were also excellent. Mr Madden as the teacher still in love with his childhood sweetheart and struggling to keep his dignity and his job was played by Daniel Boys, whilst the childhood sweetheart turned Hollywood failure Jennifer Lore was played by the watchable Sarah Earnshaw, and the spurned and jealous friend who would do anything to get the one-upmanship, even sabotaging St. Bernadette's Nativity play in the cathedral, Mr Shakespeare, was played with a touch of pantomimic malevolence by Andy Brady. 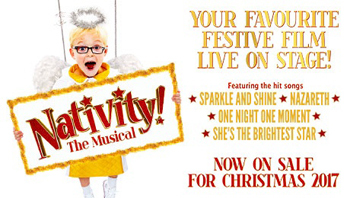 With a live 5-piece band in the pits (Michael Riley), a colourful and cleverly designed seasonal set (David Woodhead), effective and imaginative LX and SFX (Tim Mitchell), choreography that fitted and suited (Andrew Wright), and spot-on and very slick directing (Debbie Isitt) this is a sure fire feel-good family Christmastime hit. The standing ovation at the end said it all - well done to all involved; what a magical experience for young and (a-hem) old alike!